“Errors are notoriously hard to kill”, [British physicist Hertha Ayrton] asserted, “but an error that ascribes to a man what was actually the work of a woman has more lives than a cat”. Today is Ada Lovelace Day, and I’m joining the celebrations with a review of an excellent book about the role of women in science throughout history. You can see my posts from previous years here: Women in Science: An Ada Lovelace Day wishlist (2010) and Happy Ada Lovelace Day (2011). I am asking new questions about heroism. I am asking about the girls who did what I didn’t, who felt social pressures not to pursue science but did anyway. I am asking about the lives they led once they became women and certifiable scientists, and I am asking about how it was that many of the best female scientific minds were ignored largely because they were never certified as “scientists”. 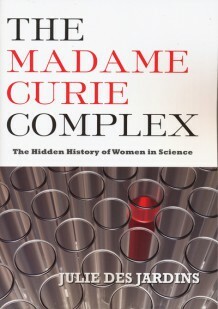 The Madame Curie Complex includes biographical details about women such as Marie Curie, Rosalind Franklin, Lillian Gilberth, Jane Goodall, Evelyn Fox Keller, Barbara McClinkton, Williamina Paton Fleming, Rachel Carson or Cecilia Payne; but interesting as these were, the most interesting thing of all is how Julie Des Jardins uses them as a point of departure to examine the culture of science, the ways in which it has and hasn’t changed since the late nineteenth-century, and why this culture makes it more likely that women’s contributions will become invisible. Women can never be the true heroines of “great science”, just wannabes and impostors, since the cast of such science is male by default. Twentieth-century science has been buoyed by myths that create prestige in masculine terms, and thus it is not enough to provide a laundry list of the women who nevertheless managed to earn entrance and accolades into its elite circles. Such stories could never be anything more than a fragmentary and compensatory history, filling yet another volume of “exceptional women who performed outside their skins”. I’ve had to question the concept of scientific heroism and define it by other means. We continue to venerate the lone maverick, male by definition, rather than the collective experience for which evidence of a female presence is greater. This lone maverick is also endearingly eccentric, a trait that has been imagined as unique to male genius. Physicists who isolated electrons and built cyclotrons have been described over the years as “baffled by can openers”. Eleanor Jette described physicist Niels Bohr the same way biographers have the mythical Pierre Curie: as an absentminded professor, too stuck in his head to notice worldly things. Wrapped up in his thoughts as he walked the Paris streets, unsuspecting Pierre was killed by horse and carriage. According to Jette, Bohr almost suffered the same fate in front of the Tech Area of Los Alamos. A historian took it on the authority of a Los Alamos chef that world-class scientists walked the grounds aimlessly at 4:00 am, perpetually caught up in theoretical problems. Women rarely have been depicted as exhibiting such single-minded intensity. Even when Marie Curie has been so described, she has never simultaneously been a likable, larger-than-life personality. For her, there has always been a trade-off; her scientific mind has relegated her to a life of serious and quiet contemplation. The reasons why we imagine this eccentric genius as male are multiple and complex, as are the reasons why we privilege the great sudden flash of insight over methodical, cumulative work in our genius narratives. As Des Jardins points out, this last tendency is not inherently sexist, but because for historical reasons women have been relegated to positions where cumulative or collaborative work is more common, minimising this kind of achievement has affected them disproportionately. There’s also a chicken-or-the-egg question in here somewhere: do we exclude collaboration from our cultural understanding of genius because we code it as feminine, or do we code it as feminine because we think of it as inferior? I was particularly pleased that Des Jardins managed to identify a historical tradition of “women’s work” within science without ever essentialising women or buying into the gendering of certain skills or fields of study. Women are not inherently more social, better at working together, or less likely to go for theorising or abstract thinking. The gendering of these activities exists, but it’s the result of cultural practices and is therefore far from inevitable. Curie’s myth haunts these pages and the psyches of succeeding generations of women more completely than her real-life example, for it has both empowered and stigmatized women, liberated and constrained them, often at the same time. The historian Margaret Rossitier noted an inferiority complex in women after Curie’s tour of the United States in the 1920s, and for generations the Curie complex has continued to allow men to disqualify women—and women to disqualify themselves—from science. Women scientists have felt as though they cannot measure up to Curie, and of course how could they, when this mythical measure of female competence has morphed in the American mind over and over again? It’s like trying to hit a moving target. 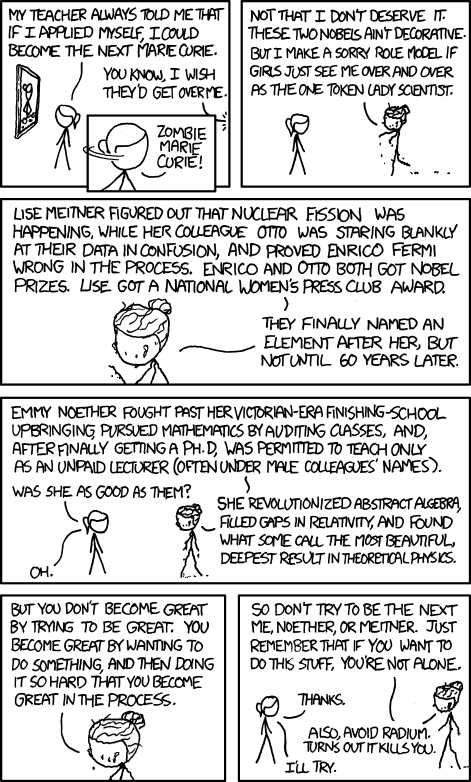 The sad irony is that Curie was simultaneously perceived as a superwoman who “transcended” her gender in a way ordinary women couldn’t and perceived in ways that forced her into the mould of traditional femininity: for example, even though Curie always emphasised “pure science” and the joy of discovery for its own sake when talking about her work on radium, the press portrayed her as someone primarily interested in trying to cure cancer because this was then seen as safely “feminine” care work. She could therefore be painted as “maternally benevolent”, which removed some of the threat to gender stereotypes her mere existence posed. These contradictory perceptions persist until the present day, and they are symptomatic of the issues that still surround women in science. In this we see two sides of the image-making coin: Meloney deliberately had shaped Curie into a maternal martyr who had used science for womanly ends; but this portrait also evoked an image of a superwoman, too smart, too dedicated, two focused, and too talented to be emulated by ordinary women. Trying to shape Curie in appealing ways, Meloney unwittingly kept alive popular stereotypes about women and science. To succeed in men’s fields, women couldn’t be themselves; they had to perform better than men, much as Curie had. Institutional sexism remained unchallenged, as women told themselves simply to work harder or publish more. Meloney had created a schizophrenic figure: a serious scientist (masculine type) and a sacrificing woman (maternal type), both inherently incompatible. In the minds of male employers, women would always fall short of the ideal, and women who internalized their alleged deficiencies could not move forward. As I have described this tradition of women in science, perhaps I have come close to sounding biologically essentialist. It is important to emphasize here that this tradition is culturally rather than biologically maternal or womanly, for women’s social location in science and society has been the primary focus in its creation. Women are not inherently closer to nature than men are. Such assumptions have followed as the historical consequence of women’s being assigned to maternal status and work, as well as their being denied access to professional science, characterized throughout the twentieth-century by its containment of nature in artificial settings dominated by men. I can’t resist finishing this post with the xkcd strip below. I know I posted it last year too, but it’s too perfect a summary of this book for me to be able to resist. Perhaps posting it every year will become an Ada Lovelace Day tradition for me. I'm pretty sure I hadn't even heard of Ada Lovelace Day before you started posting about it: you're definitely doing your bit! This is a must read for me! I'm glad you posted about it. So many female scientists were considered their husbands' assistants when they were doing science in their own right. I can't even imagine how far back scientific advancement would be without women. Just because men get all the credit doesn't mean they did all the hard work, and made all the discoveries. It's sad, and I am glad that you are here, giving voice to this day, Ana. We need more of this. I've had this book on my TBR list for ages; clearly I need to move it up! My niece is obsessed w nature stuff right now (and the tv show Wild Kratts), so I enjoy talking about all the different kinds of scientists there are that study such things. And I tell her 'oh, look at you, conducting an experiment/making observations/forming a hypothesis/etc. you're being a scientist!' whenever she's doing something science-y. What a great title for the book. The necessity for those in non-traditional fields (whether by gender or race) to excel - drastically excel - in order to even be recognized is often overlooked. I am so very happy that this book is sitting on a shelf right over my head as I type here or I would have had to immediately go buy it. While I was obviously already intrigued enough by it to have bought it, I'm ever so much more so after reading your incredible review, Ana! I swear, as soon as I get back from Brazil, I'm buying this book. It sounds amazing and like it should be compulsory reading for any woman (interested) in science. That "Anonymous" was me... apparently today I'm having some tech issues. 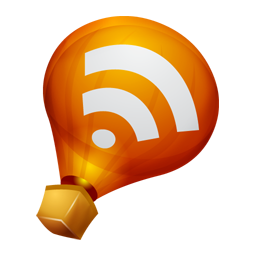 Great review, I love the many quotes you have included in your post. Just read Alex' review by the way, it made me realise how important it is that there is such a day as Ada Lovelace day. I realize this is TOTALLY not the point of the post or of the comic you shared, but both make me want to read more about Marie Curie. I am fascinated by the way the press interpreted her work to make her seem "safely feminine" even though she didn't ever say the stuff they say she did. I think they did the same thing with Helen Keller - totally made her into someone safe when she was a total radical. Sakura: Yes, exactly! The book is full of examples like that. I definitely think it's right up your alley. Zibilee: I try! What I loved about the book is that Des Jardins goes beyond just trying to reclaim credit for the women whose contributions were important. That's important, but she also explains why historically women have been barred from opportunities to make a difference, and that matters a lot too. Eva: I love how you do that with your niece! And your story kind of illustrates the book's point, in the sense that it's an example of how misinformation about what "counts" as science drives people away. And throughout history most of those people have been women, unfortunately. Stefanie: Do borrow it again when you have the chance! It's such an excellent read. Bettina: Yes, definitely a must read! Kelly: Yes, it really was. Chinoiseries: Yep - it's definitely a reminder of why the day is needed. Aarti: That's exactly how I felt when I finished the book. Now I just need to decide which Marie Curie biography to read, since there are a couple of different ones. I've read in a few difference places that Florence Nightingale is another example of this. She was portrayed, and is mostly remembered, as a "ministering angel", but in reality she was really interested in statistics and sanitation. That was kind of brushed aside, though, because it wasn't as feminine as tending to wounded soldiers.